James Dietz Handsigned and Numbered Limited Edition Artist Proof Print:"High Ground at Easy Red"
Size: 26" x 14.75"/ Overall Size: 32" x 21.25"
About the Art: Omaha beach is four miles long and bordered on each end by two cliffs over 100 feet high. At low tide, wide, hard-packed tidal flats lead upwards from the beach towards commanding bluffs. It was at these bluffs that the men of the US 1st Army would consolidate prior to moving inland into France. But first, the beaches had to be traversed. This scene, commemorating the 60th Anniversary of D-Day, depicts the 743rd Tank Battalion leaving the beaches the evening of June 6th. Their ordeal began over 12 hours earlier. At H-50, the 741st Tank Battalion, scheduled to land in the 16th Infantry's sector suffered a terrible disaster. Of the thirty-two Sherman tanks that debarked 6,000 yards off the eastern half of Omaha beach only six tanks made it to shore. The remainder sank to the bottom of the English Channel due to heavy seas. Someone in the 741st used a tank radio to contact the 743rd Tank Battalion to inform them of their fate, saving the lives and tanks of the 743rd and allowing them to get to shore to protect the infantry. 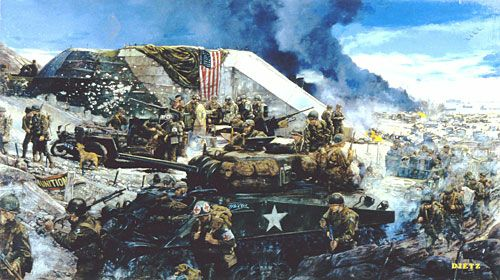 The 743rd Tank Battalion was able to successfully land most of their Sherman's in the initial wave on Omaha's western beaches. They provided invaluable support to both the 116th Infantry and the 16th Infantry on the eastern beaches. The 743rd Tank Battalion left Omaha Beach through both the D-3 exit road and E-1 exit road at St. Laurent-sur-Mer. As one soldier observed, "Standing out there on the water beyond all this wreckage was the greatest armada man has ever seen. You simply could not believe the gigantic collection of ships that lay out there waiting to unload. Looking from the bluff, it lay thick and clear to the far horizon of the sea and on beyond, and it spread out to the sides and was miles wide. Its utter enormity would move the hardest man". The landings at Omaha Beach had incurred significant casualties and in fact, the enemy defenses were stronger than expected. Very little progress had been made in the push to the interior and this caused significant backups on the beach. Of the 2,400 tons that were planned to arrive on the beach on D-Day, only 100 tons were delivered. Operations on the 7th and 8th of June would be spent deepening the bridgehead. As the Tankers entered combat to expand the beachhead, few would forecast the hardships that lay ahead in the Norman hedgerows of the Bocage. Though thousands of Americans were spilled onto Omaha beach, the high ground was won by a handful of men who on that day burned with a flame bright beyond common understanding. For its action on June 6th, the 743rd Tank Battalion, commanded by Colonel John Upham, was awarded the Distinguished Unit Citation, French Croix de Guerre and a Bronze Arrowhead in recognition of their participation in the Assault Landing.